Need a towing service? 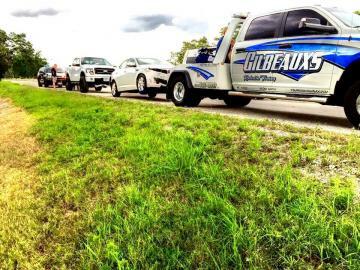 At Gilbeauxs Towing, our drivers are highly experienced, and eager to provide you top-notch support. Whether you need us to come help you when your car's broken down, or you'd like us to remove a vehicle from your property, we'll be more than happy to do so. If you're in the Orange, TX, area, and you have any need for towing services, we'd love to help in any capacity necessary. No matter what your make and model, we’ve got the proper know-how and equipment to successfully move it. We can handle any problem from the passenger car to a major semi tractor trailer accident. We have the equipment, personnel, and the experience to do the job. We’re the best choice, so when you need a tow in Orange, TX, make us your first call. When you see our impressive service and friendly staff, you’ll be glad that you chose us.